TableLayout organizes content into rows and columns. 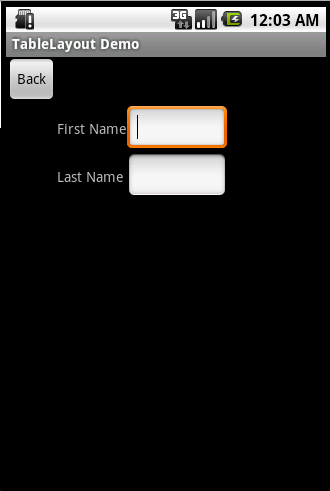 The rows are defined in the layout XML, and the columns are determined automatically by Android. This is done by creating at least one column for each element. So, for example, if you had a row with two elements and a row with five elements then you would have a layout with two rows and five columns. You can specify that an element should occupy more than one column using android:layout_span. This can increase the total column count as well, so if we have a row with two elements and each element has android:layout_span=”3″ then you will have at least six columns in your table. By default, Android places each element in the first unused column in the row. You can, however, specify the column an element should occupy using android:layout_column. Here is some sample XML using TableLayout. This is the result of that XML. Posted by Sheridan on Tuesday, January 5, 2010, at 10:31 pm. Filed under Beginner. Follow any responses to this post with its comments RSS feed. You can post a comment or trackback from your blog. This one is great Keep going on!! Great stuff – you nailed this one. good going man.. m fully satisfied……. hello, this tutorial is a great one, keep going so that people like me can learn esear in these way…and by the way, I descovered recentley Sublime Text 2. it is very powerfull. I apologize for my english.Thanks! Cool one.. ! I just learned layouts now, whats next as a beginer? Thanks so much for the clear tutorial. I especially like how you provided a screenshot with each XML example. A bit miffed that layouts keep changing as technology progresses. The Android 3.2 way of layouts has me specifying resolutions in the layout structure. Ah well… thanks again for the jump start into understanding the different types of layouts. bit of it and I have you saved as a favorite to check out new information on your web site. I just like the helpful info you provide for your articles. I’ll bookmark your weblog and check again right here regularly. I’m relatively sure I will learn many new stuff proper right here! Good luck for the following! information about once a week. I opted in for your Feed as well. A Very useful and easy to understand tutorial, thank you very much! Thanks for this tutorial, this really saved my time as i was following an android tutorial and got stuck due to different layouts available. thanx mate.that helps alot to understand the Relative Layout for new Programmer. Thanks, great site for learning Android!